The routes are grouped below into regions to enable you to find something to hike over in the area that you're visiting. From the wild, rough and technically challenging peaks of Arran, Skye and Rum contrast with the easier hills on Uist, Harris and Mull. Some long walks into wild area to reach mountains with wonderful, distant views. 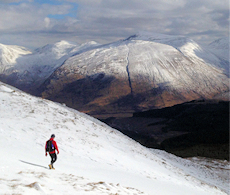 Long chains of peaks enable multi-Munro and Corbett bagging days with superb views. Vast areas of high moorland and artic-tundra sit above craggy dark corries. 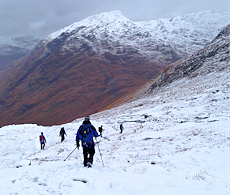 Around Glencoe, Etive, Laggan and Nevis, rugged peaks sit in areas steeped in history. Popular hills and mountains, typically with well-defined paths, introduce many people to the pleasures of hill-walking and climbing. No Munros, but plenty of other hills with character. The remote areas in Galloway give way to more accessible hills nearing the populated Central Belt.